Left: Mesquite Grill and Seafood owner Robert Zamani shares his passion for food. that is displayed for sale at the restaurant. Tucked away in a shopping center in the heart of the Denver Tech Center is a little restaurant known for its gigantic flavors! Mesquite Grill and Seafood has been feeding Denver area guests for more than fifteen years, and is owned by Castle Pines residents Robert and Wendy Zamani. Robert Zamani grew up in the restaurant industry, starting out as a dishwasher and working his way up to becoming a chef. In the late 1980’s Zamani created a one-of-a-kind mesquite wood grill that allowed him to infuse true mesquite flavors into seafood, beef and poultry. Pure mesquite stokes the fire of Zamani’s 725 degree grill that sears meat and seafood, locking in the flavor, and infusing the protein with an amazing mesquite aroma and taste. From Zamani’s home-made grill, his vision for a restaurant was born. With the help of his wife Wendy and their three children, the Mesquite Grill opened in 1988. Through the years, the restaurant has been a family affair with Zamani’s three children learning the trade from their father. Daughter Megan worked in the kitchen as a teenager and is today away at college, and Zamani’s other two children Sarah (17) and Michael (15) still play an active role in the day-to-day operations. Aside from working in the restaurant, Sarah creates custom jewelry for sale in the restaurant’s small boutique, and wife Wendy creates custom glassware for sale as well. The Mesquite Grill offers up the freshest in meat and seafood, only serving up prime grass fed mid-west beef, and fresh seafood from as far away as Southeast Asia. The ambiance of the Mesquite Grill is charming and cozy with its bright colors and linens on the tables. 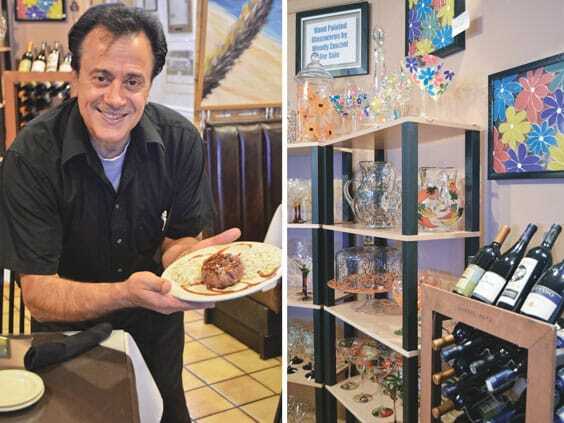 Zamani serves up “big portions of passion and soul” with each and every dish, and you can catch him and Wendy there almost every night, treating their guests as if they were family.